The "Mnuchin Plunge Protection Team/Government Shutdown" rally extended overnight, and is now more than 13% from the Dec 24 lows with US equity futures and European stocks rising following a strong Asian session following a since-denied WSJ report that the US is considering easing Chinese tariffs to boost the market, followed by a report that China has told local governments to push consumption of cars and home appliances. 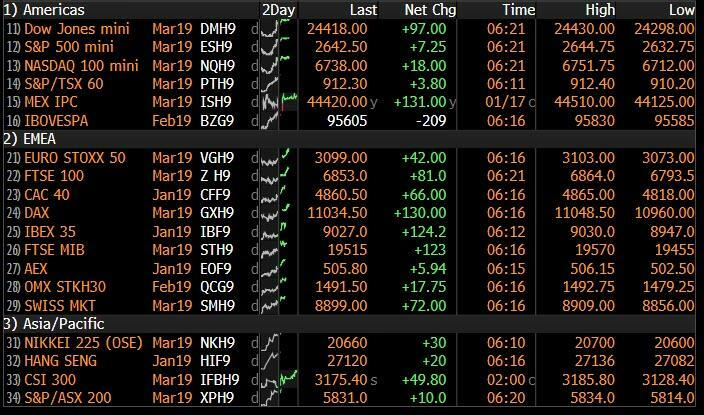 The result is a sea of green in global markets, which look set to close the week at one-month highs, while safe-haven assets continued to decline with Treasuries, the yen and gold all edging lower. In overnight political news, the White House confirmed US President Trump canceled the delegation trip to Davos amid a government shutdown, while the White House also stated that US President Trump and Treasury Secretary Mnuchin are to hold Oval Office meeting today. Elsewhere, US Treasury Secretary Mnuchin has declined a request to testify next week regarding government shutdown according to US House Ways and Means Committee Chairman Neal, while the US Treasury instead offered to send senior officials to the Way and Means hearing.